The operating frequency is 60 Hz in the U.S. and 50 Hz in Europe, Australia, and part of Asia. The three-phase system has three phase conductors. The system voltage is defined as the RMS voltage between the conductors, also called line-to-line voltage. The voltage between the phase conductor and ground, called line-to-ground voltage, is equal to the line-to-line voltage divided by the square root of three. The generating station produces the electric energy. The generator voltage is usually around 15 to 25 kV. This relatively low voltage is not appropriate for the transmission of energy over long distances. At the generating station a transformer is used to increase the voltage and reduce the current. In Figure 1 the voltage is increased to 500 kV and an extra-high voltage (EHV) line transmits the generator-produced energy to a distant substation. The voltage is reduced at the 500 kV/220 kV EHV substation to the high voltage level and high voltage lines transmit the energy to high voltage substations located within cities. At the high voltage substation the voltage is reduced to 69 kV. Sub-transmission lines connect the high voltage substation to many local distribution stations located within cities. Sub-transmission lines are frequently located along major streets. The voltage is reduced to 12 kV at the distribution substation. Several distribution lines emanate from each distribution substation as overhead or underground lines. Distribution lines distribute the energy along streets and alleys. Each line supplies several step-down transformers distributed along the line. The distribution transformer reduces the voltage to 230/115 V, which supplies houses, shopping centers, and other local loads. 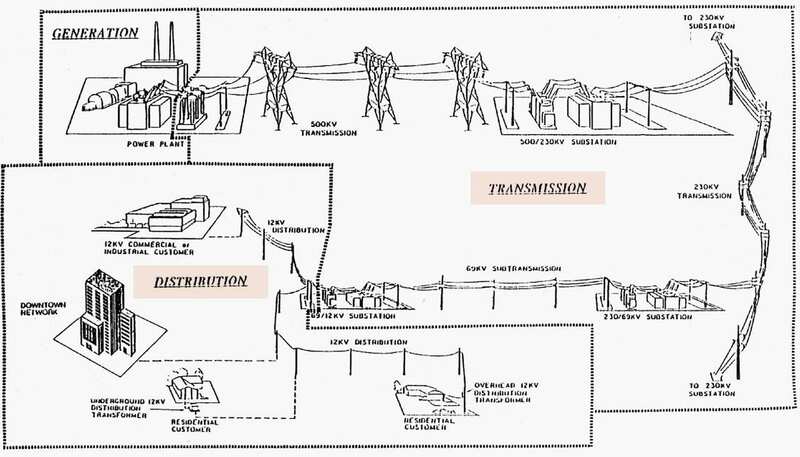 The large industrial plants and factories are supplied directly by a subtransmission line or a dedicated distribution line as shown in Figure 1 above. 1 DC Transmission and Distribution . 2 Insulator Pollution In Transmission Lines . 3 Energy Transmission and Distribution Guide . 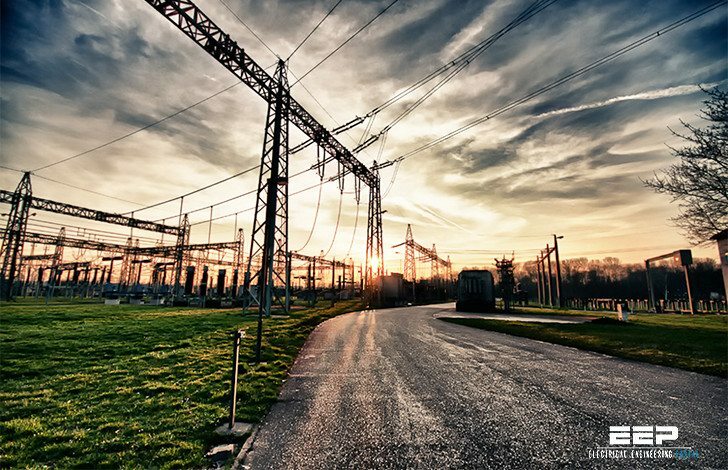 4 Guide to High Voltage Direct Current (HVDC) Transmission . 5 Design and construction of long-distance HV transmission systems . 6 Transmission And Distribution Electrical Engineering . 7 De-icing EHV Overhead Transmission Lines by Short circuit Currents . 8 Guide to Planning of Electric Power Distribution . 9 Handbook for installation of MV lines in rural electricity systems . 10 Guide to power distribution systems for electrical engineers . 11 Reliability comparison between different 400 kV substation designs . 12 Power grid and centralized substation protection and control . 13 Guidelines for HV circuit breaker function and test methods . 14 High voltage live work and practices manual . 15 Transmission substation work practice manual . 16 A case study on SCADA implementation in 220 kV substation . 17 Handbook for electrical distribution and transmission fieldworkers . 18 Guideline for connecting generating plants to the medium voltage network . 19 General specifications for a customer-owned 69 kV outdoor substation . 20 Recommended practices for maintenance of LV/MV/HV electrical equipment . 21 Energy transmission and distribution over lines and cables in power systems . 22 Experience with commissioning & testing complex busbar protection schemes . 23 Primary-side protection of distribution substation transformers . 24 Interconnecting mini-grids (up to 200 kW) with the central electric grid . 25 Lecture notes on high voltage engineering . 26 Design and installation of low voltage busbar trunking systems (verified to BS EN 61439-6) . 27 The basics of high voltage cables for underground energy transmission . 28 High voltage safety in marine and other electrical installations . 29 SCADA applications in thermal power plants (TPPs) . 30 Introduction on HVDC transmission systems and HVDC Submarine Power Cables in the World . 31 Voltage drop calculations and design of urban distribution feeders . 32 Fundamentals of High Voltage Circuit Breakers, Switching Stresses and Failure Modes . 33 Medium Voltage DC Applications And Future Scenarios (That Thomas Edison Has Started…) . 34 Operations And Maintenance Of Electrical Power And Distribution Systems . 35 Technical Issues Of Undergrounding High Voltage Transmission Lines . 36 Experience In Implementation Of Relay-Control House For 230 kV Transmission Substation . 37 Construction Techniques In Power Transmission, Hydropower and Photovoltaic Projects . 38 400/220 kV gas insulated (GIS) transmission substation controlled by SCADA . 39 Experience with IEC 61850 in the refurbishment of 380kV power substation . 40 Design And Construction Of Electrical Transmission And Distribution Lines . 41 Implementing Clean Power Plans For Utilities (EPA’s Menu of Options) . 42 Design of Electrical Power Systems for Nuclear Power Plants (NPP) . 43 Offshore Wind Park Connection To an HVDC Platform Without Using an AC Collector Platform . 44 Calculation Of Prospective Short-Circuit Currents On T&D Systems (Practical Guidance) . 45 Transmission Switching Manual For Grid Operators . 46 High voltage facts for undergraduate and postgraduate students of electrical engineering . 47 Class notes on electrical power transmission and distribution (for students, 6th semester) . 48 Technology of High Voltage DC (HVDC) Networks, Their Applications and Problems . 49 Class Notes on Power System Control and Operation . 50 On-shore electrical infrastructure for supplying vessels with electric power in port . 51 Lecture notes on power system engineering for students (6th and 7th semester B.Tech) . 52 Design of SCADA for remote control and operation of wind power plants . 53 The fundamentals of steam power plants . 54 Design of SCADA for remote control and operation of wind power plants . 55 Power systems in deep ocean mining up to 3,500 m .
56 High voltage generation, overvoltages in power grids and insulation coordination . 57 Design and installation of 12 kV gas-insulated load break switch . 58 Design project of 500kV HVDC transmission line from Ethiopia to Kenya . 59 Centralized fault locating system in Vietnam’s power transmission grid . 60 Basic setting of current differential line protection . 60 The basics of Gas Insulated Substation (GIS) for students . 61 Construction of a grid substation for engineers and technical supervisors . 61 The essentials of high-voltage breakdown and electrical discharges . 62 Practical training report on 220/66/11 KV substation . 63 Lecture notes on power station engineering for students . 64 Detailed electrical design of a small hydropower plant (from turbine, generator to transformer) . 65 Short-circuit calculations of the electric power system in a nuclear power plant . 66 Experience in installation of new reactive power compensation on power grid . 67 Transmission and distribution technology overview . 68 High voltage D.C. transmission systems (DC link control, converters & smoothing reactors) . 69 Equipment in electricity distribution networks – Latest developments review . 70 The essentials of AC and DC power distribution systems for students . What is effect of use of shunt capacitor installed in 33 KV side at 132/33 KV grid station ? What is function of OLTC ( On load Tap changer) in 132/33 KV power transformer 132 KV side at 132/33 KV grid station? & When to use it ? What is reason of low voltage ( 116 KV) supply at 132 KV level at 132/33 KV grid station coming from 220/132 KV grid Station during peak load hours ? Sir,please tell how to join practical or video training on electrical engineering like about industrial automation&PLC scada course.or any other like autocad on electrical engineering subjects. Please confirm any information about this I want immediately this.